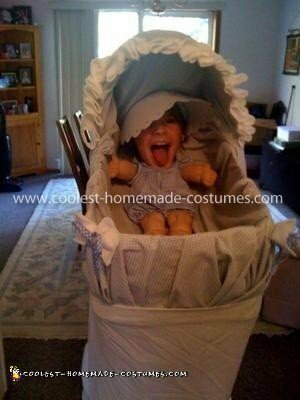 The coolest Baby Costume Ever! 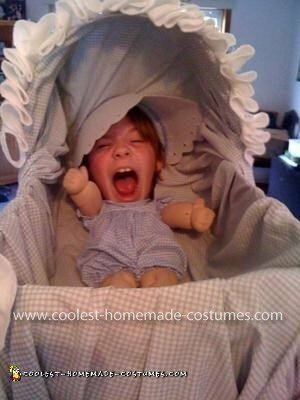 I made this Baby in a Bassinet Illusion costume for my 10 year old out of cardboard fabric and a cabbage patch doll with its head cut off. Everything was hot glued together. We used a velcro belt with a pocket and a thin pvc pipe attached to the front of the bassinet to his waist to hold it up. Then we accessorized with small baby things like a dolls diaper with a melted tootsie roll in side a bottle and some bears. Also I cut two small holes underneath the bassinet and attached two pencils inside the arms, the pencils went through the holes and he was able to move the arms. 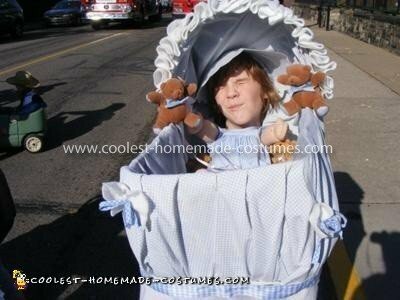 Last we covered his legs with a bed skirt and made it look like a bassinet skirt. This was a very fun costume! It was a little hard to see and walk up curbs wearing this costume but he didn’t mind so much because all the girls just loved it! Homemade costume idea posted by Jennifer V.